Perl6 (Rakudo) - How to handle special characters from file? How can I read special characters from a external file ? 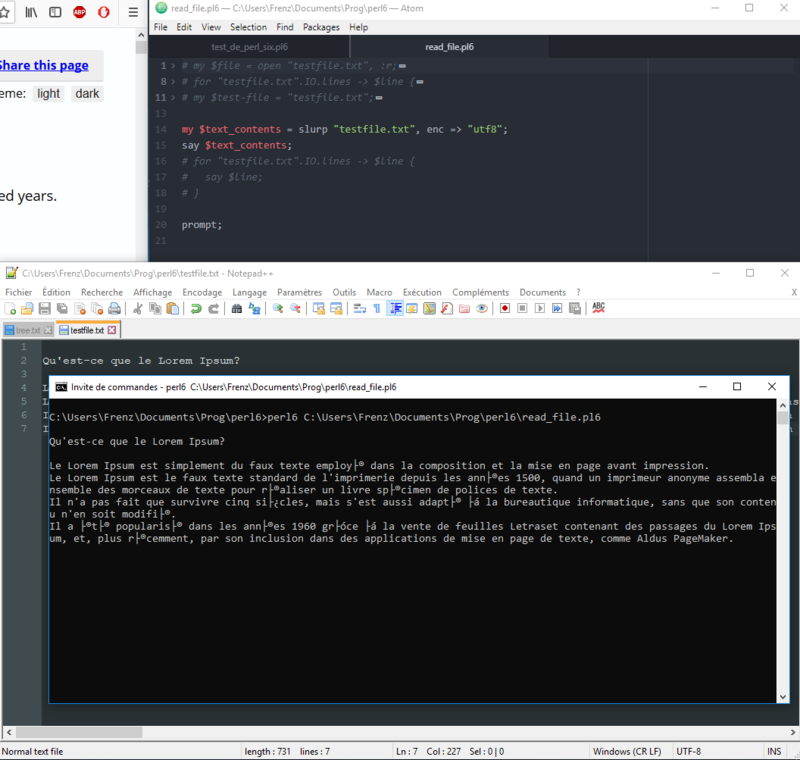 Here a simple .txt file in French, which content is the first paragraph of https://fr.lipsum.com/ : as you can see on my screenshot, the file encoding is UTF-8 but the accents are not displayed correctly. With Python or Ruby scripts I don't encounter the problem. I can't found any precise example about that matter, probably because perl 6 is still quite recent (??). Thank you. TL;DR If you're using Windows 10, you probably just need to click the right option in the control panel. If you're using an older version, please tell us which version you're using and we'll go from there. Your problem seems to be the console output encoding not being utf8 and/or the font being an ANSI one. They got off on the wrong foot with their Unicode support up over the last couple decades. They have just very recently begun digging their way out of the hole they dug for themselves and everyone else. But they're not there yet, at least inasmuch as things don't work correctly out of the box for many end users. I think this is the root of your problem. Adding convoluted workarounds to Rakudo is a low priority thing compared to working with Microsoft's renewed efforts to do the right thing. If you're using Windows 10, focus on the new "Beta: Use Unicode UTF-8 for worldwide language support" option. Expect it to work only if you're lucky. (It's still beta status.) Be patient if it doesn't. We'll do our best in the latter case but it's new for everyone. If you're using an older Windows, expect it to not work at first with modern software unless you are very lucky (and it seems you have not been). We'll still help as much as we can but it'll likely involve you being patient with us and Microsoft and Rakudo and vice-versa. There will no doubt be practical workarounds added over time to Rakudo as the dust settles around it and the new phase of Unicode's dominance which P6 is written to assume as the default. And Microsoft will likely make it easier to have their tech do the right thing with Unicode. But for now the solution boils down to selecting the correct options within Windows and it looks like you haven't yet done that. Not the answer you're looking for? Browse other questions tagged io character-encoding perl6 rakudo or ask your own question. How do I read from STDIN in Rakudo Perl6?